Few people can resist pictures of kids with their dogs. Together they are the perfect combo of cute and cuddly. 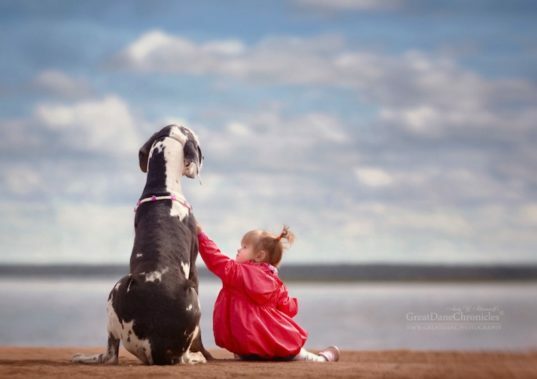 St.Petersburg-based photographer Andy Seliverstoff captures graceful, poignant and sometimes awe-inspiring snapshots in time of kids and their canine companions in his series “Little Kids and Their Big Dogs.” Children are seen interacting with some impressively sized gentle giants, both in the midst of play or quiet reflection. Read on for more about these idyllic moments that are frozen in time and sure to be eternally treasured. Seliverstoff’s interest in photography began long ago, but several years ago, he decided to focus completely on photographing dogs. Seliverstoff has a soft spot for Great Danes, and his love of big dogs inspired him to create his popular series. Juxtaposing these little people with their giant dogs automatically results in amusing images, but the bonds and trust that are evident between the children and their dogs make the pictures surprisingly poignant as well. Whether frolicking through fields and snow, playing ball, or simply watching the world go by, the kids and their dogs look utterly at home with each other. Size clearly has no effect on their relationship, other than the fact that the dogs frequently become convenient beds or comforting places for kids to rest on or lean against. These gentle giants protect and attend to their kids (and occasionally put up with their pulling and prodding). Seliverstoff spends lots of time getting to know his canine subjects so that he can then capture their personality through his camera lens. In all of these images, one thing is clear: dogs sure love their little people, and that love, beautifully captured by Seliverstoff in a way that almost makes it tangible, is definitely reciprocated. Seliverstoff’s images will be available in early 2017 in book form: Little Kids and Their Big Dogs. It’s a perfect gift for the dog-lover in your life. Few people can resist pictures of kids with their dogs. Together they are the perfect combo of cute and cuddly. 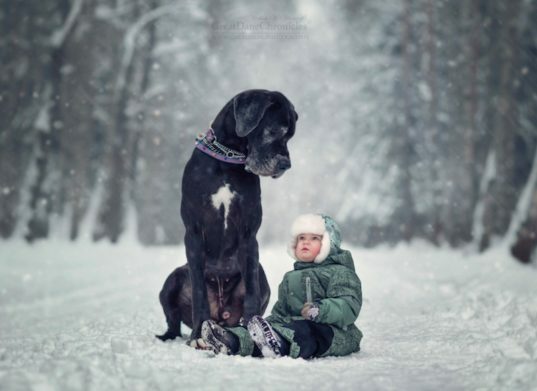 St.Petersburg-based photographer Andy Seliverstoff captures graceful, poignant and sometimes awe-inspiring snapshots in time of kids and their canine companions in his series "Little Kids and Their Big Dogs." Children are seen interacting with some impressively sized gentle giants, both in the midst of play or quiet reflection. Read on for more about these idyllic moments that are frozen in time and sure to be eternally treasured. Seliverstoff's interest in photography began long ago, but several years ago, he decided to focus completely on photographing dogs. Seliverstoff has a soft spot for Great Danes, and his love of big dogs inspired him to create his popular series. Juxtaposing these little people with their giant dogs automatically results in amusing images, but the bonds and trust that are evident between the children and their dogs make the pictures surprisingly poignant as well. Whether frolicking through fields and snow, playing ball, or simply watching the world go by, the kids and their dogs look utterly at home with each other. Size clearly has no effect on their relationship, other than the fact that the dogs frequently become convenient beds or comforting places for kids to rest on or lean against. These gentle giants protect and attend to their kids (and occasionally put up with their pulling and prodding). Seliverstoff spends lots of time getting to know his canine subjects so that he can then capture their personality through his camera lens. In all of these images, one thing is clear: dogs sure love their little people, and that love, beautifully captured by Seliverstoff, in a way that almost makes it tangible, is definitely reciprocated. Seliverstoff's images will be available in early 2017 in book form: Little Kids and Their Big Dogs. It's a perfect gift for the dog-lover in your life.